Through the past two years, we’ve developed numerous pop-up stores for our Better Block projects and have learned several lessons along the way that we hope others can use in developing their own stores. These ideas actually work well in permanent shops also, but we’ve had quite a bit of experience in building temporary businesses. In some cases, we don’t have the room to apply all of the ideas, but incorporating as many as possible can help bring more foot traffic into the shop. First of all, think of the store as a social experience that happens to include a retail and service component. People want an excuse to spend time around the things they love and people that share that same love. This is universal. Most retail stores don’t provide this opportunity, which leaves people feeling as if they’re not welcome to stay after they’ve finished browsing. We’ll use our local Oak Cliff Bicycle Company bike shop as an example to follow for creating a socially centered store (though this can easily be applied to floral shops, craft stores, cafes and more). So when building a shop, break up the store into four sections: an outdoor/invitational area, a retail area, a service area, and a sitting area that allows easy conversation and observation of the service area. The first area we’ve found is key to develop is the front door/window space. Any ability to create interplay between the sidewalk and the entrance helps create a welcoming environment. Open doors with merchandise spilling out onto the sidewalk, including sandwich boards with information and exciting windows, helps invite people into the space. The retail area should have regular mid and high price items, but be sure to include a large $30/under area for people to have items that they feel comfortable buying without shelling out a large amount for. In the world of live music, this is what we call the “merch” table. It should be filled with t-shirts, stickers, magazines, posters, tubes, accessories, and more. It’s a great idea to put your brand and local area on as many items as possible, because people love to show pride in their neighborhood and promote their community businesses. Plus, these items act as your marketing. 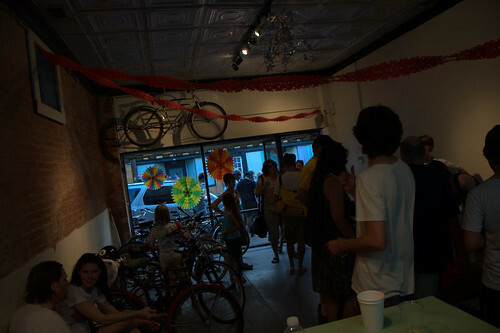 In the bike shop example, the service area is probably located at the back of the store, but should have a component that allows people to view the work taking place, and even to help out if at all possible. 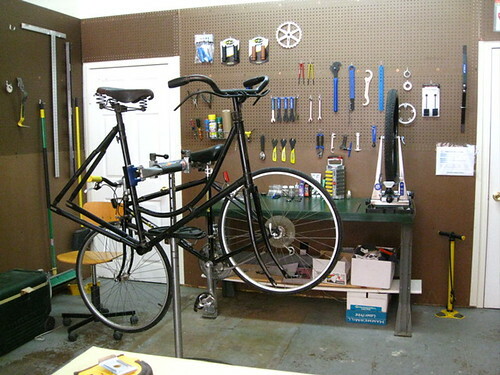 Cyclists not only love to be around bicycles, but they love watching them get built, repaired, and modified. This is no different for sewing shops, florists, et cetera. We see this commonly at Sushi bars, or cafes that allow people to be in close proximity to the brewing process. Also, people love to “talk shop”, and learn about the process. This is the area that really sets the small business apart from the nameless/faceless box store. The last component is the place for people to linger and feel like they’re welcome to watch and talk. 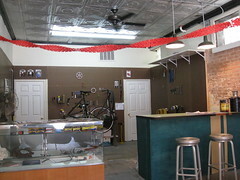 For the bike shop, it’s a bar overlooking the service desk, but it could also be a sofa with a coffee table filled with bike magazines, and a wall with a notice of events board. Another thing to note is that people want to help take part in working on the things they love, so if there’s an opportunity to have interaction with the service area, allow and encourage this to occur. It helps the shop owner, and it creates a closer connection with the community. Offering drinks, or snacks helps people feel like they’re sitting around a kitchen table and part of a family. This is not only good for the person visiting the store, but also the proprietor who wants to feel like they’re in an environment that feels like home. Lastly, it’s good to try and promote events in the space, or activities in the community that promote your industry. Setup a time slot for basic bike repair classes, or host a small bike rodeo, movie, or race in the street. We’ve even brought people in to make crepes or screen shirts in the space. One thing to note for permanent businesses is that this “social store” makes people feel more connected and loyal to the shop. This is key when you’re having to compete with large stores who can always win on price. If you’re faced with a large space that is too hard to fill, partition off the area so that you only use as much store as you need. Also, combine your shop with others to help create overlap and ease the administration. We often pair up people like furniture makers, t-shirt printers, a crafters to bring more resources into a single area. Since this is temporary, keep costs low by building as much by hand as possible. This will also makes the store feel more authentic and home grown. Merchandise can be used, or small…again, the idea is to create a social experience that encourages people to linger. Music also helps create a more comfortable environment. Social media is key to helping spread the word and giving people a regular communication resource to the shop. Just saw the video on TED today! How awesome! Can you do this with a coffee shop/bakery? I’d be kinda weirded out that the health dept might swoop in! Or maybe just get donated coffee and baked goods and share for free or donation? How did you guys get access to the stores? We’ve created coffee shops before. A local pastry chef ended up bringing out muffins and scones for our first project. We did a “donations appreciated” to get around any permitting issues. To gain access to the stores, we contacted the property owners and asked if we could turn their space into an “open house” for a weekend to see if we could get businesses to look at opening up in the area. They were amenable because often times the stores had been vacant for several months. We took out event insurance and placed the property owner on the “additional insured” list to cover any liability. I can only say fantastic! The whole idea of how to create the in and out door place is brilliant. To tell you the truth i could not expect such detail explanation but your ideas are brilliants. I was hoping to discuss about the colors and hope to add tutorial of something similar.